Wonder Boy was an instant fan of Frozen from when we saw it in the theater. His passion waned as kindergarten friends deemed it ‘for girls’ and Big Hero 6 eclipsed all. As Lil’ Wonder got big enough to sit and watch some/most of a movie, he began asking for Frozen over. And over. And over. All I had to do was play ‘Let it Go’ and any baby and toddler crisis was averted – tears dried on cheeks, anger dissipated, hunger forgot itself long enough for me to create a snack plate. And Wonder Boy would join in. So even though it was Mr. Wonder’s turn to plan a party for him, I hijacked it since there was a perfect them going on. I wanted a few things. 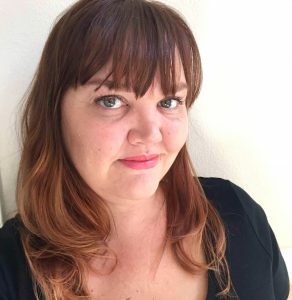 I needed it easy, I needed it to be fun and inclusive, and I wanted it toddler friendly. We had 4 toddlers and babies and 4 big brothers and sisters. Everyone had a blast with a sand box, Jell-o play dough (handmade from Modern Parents Messy Kids – we had berry, lemon and cherry- scented play dough. So a $25 purchase on Amazon for plates, napkins, cups, balloons and a plastic tablecloth for a small outdoor table was the only ‘party’ purchase I made. 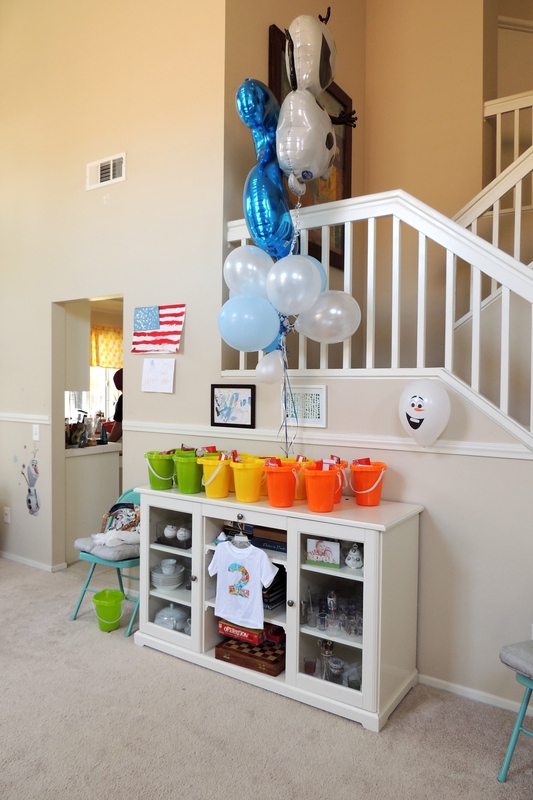 The wall clings were picked out so Lil’ Wonder can have them in his room after the party – but I have been to lazy to take them down yet. 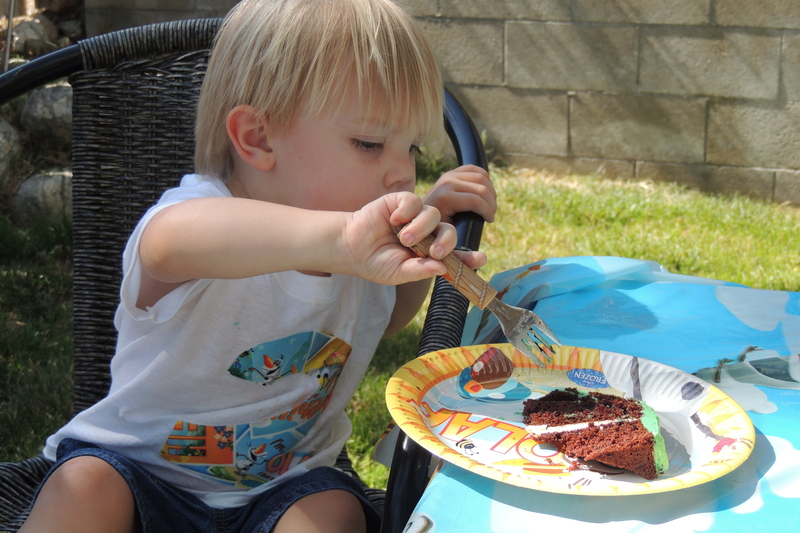 Lil’ Wonder adored his cake. 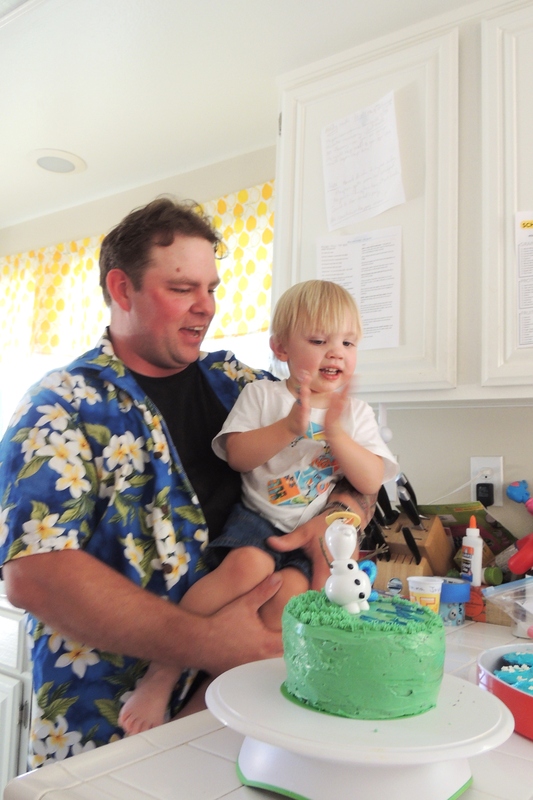 I used Smitten Kitchen’s Swiss Buttercream recipe and it worked out wonderfully, even though I had never made the recipe before and started his cake at 10 p.m. since I was alone with the kids that night. Ire ally wish i had earlier sleepers – neither of them are asleep before 9 p.m. 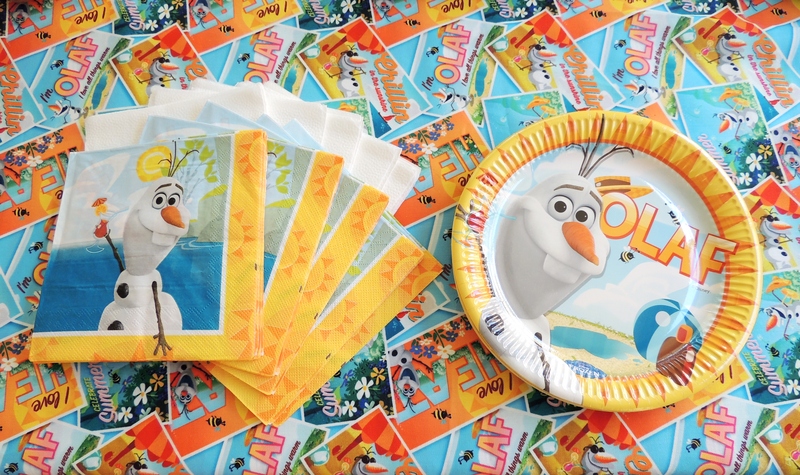 I had already spent some time trying to find Olaf gear and had decided to aim for bright colors and Hawaiian print – I had asked party guests to dress in Hawaiian print, their favorite Frozen gear, or whatever they enjoy wearing in the summer. 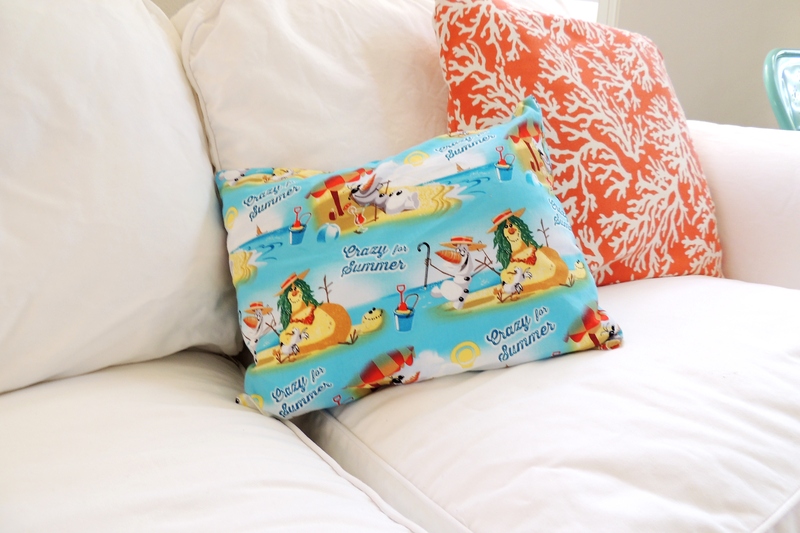 I saw the fabric for the above pillow at the last minute and made sure it was sized right for a toddler napping on the couch. But otherwise I’ll borrow it for a while – it fits my summery color scheme so well. 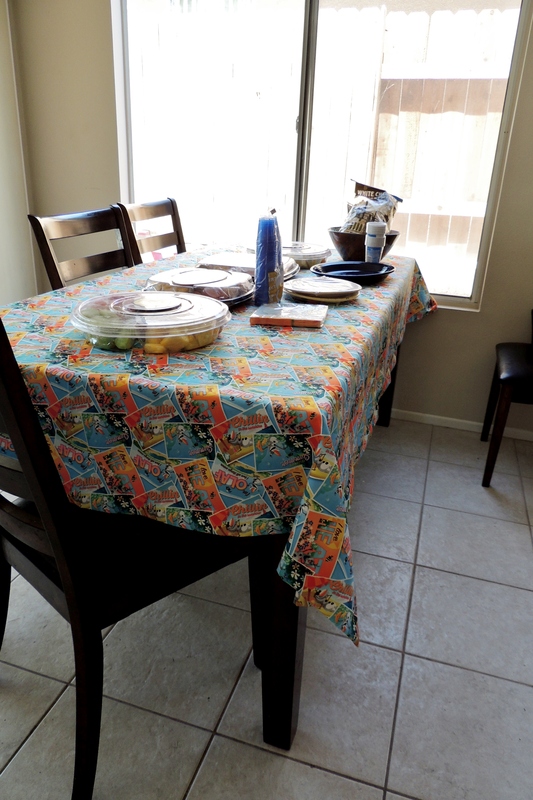 I had seen someone using this fabric on Facebook, and wanted it for the party – and got enough for a tablecloth that will keep the fun vibe all summer long. No plans for activities – the kids did what they wanted. Parents talked, family chatted, 5-year-olds wreaked havoc on my son’s room, and all was right with the world. I made sure I had Olaf noses (baby carrots) but frankly, none of the kids cared- they were there for cupcakes. Thanks to my friend Ash for taking one of these snaps for me!